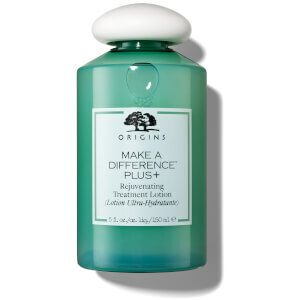 Origins Dr. Andrew Weil for Origins Relief and Resilience Soothing Treatment Lotion is a refreshing, pH balanced solution that preps freshly cleansed skin for the next steps in your skincare regime. Enriched with nutrient-rich superfood ingredients Reishi, Sea Buckthorn and Fermented Chaga, the lightweight, watery lotion feels refreshing on application and helps to visibly reduce the look of redness while restoring resilience back into sensitive skin. 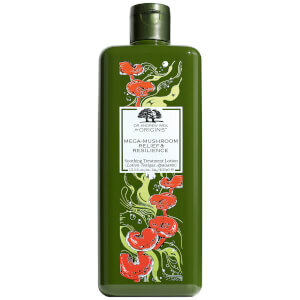 Rebalancing skin after cleansing, it will ensure the complexion feels calm and comfortable. 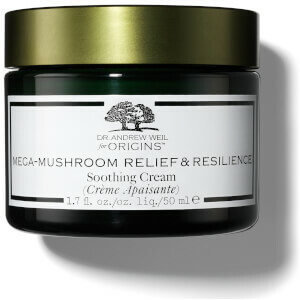 Enhancing moisture levels by 71%, skin will be left feeling soft, supple and healthy. 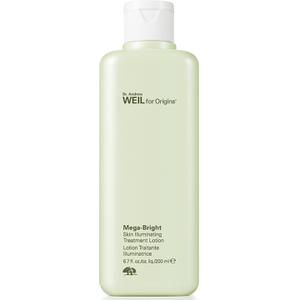 Free from alcohol, parabens, phthalates, propylene glycol, mineral oil, PABA, petrolatum, paraffin, DEA and animal ingredients*. *except cruelty free honey and beeswax. AGITE para ativar a fórmula. COLOQUE na palma da mão. APLIQUE na pele com as pontas dos dedos ou com um disco de algodão. SINTA a pele instantaneamente rejuvenescida e reequilibrada. Use de manhã e à noite. Water\Aqua\Eau, Butylene Glycol, Peg-4, Citrus Aurantium Dulcis (Orange) Oil**, Lavandula Angustifolia (Lavender) Oil**, Pogostemon Cablin (Patchouli) Oil**, Citrus Nobilis (Mandarin Orange) Peel Oil**, Pelargonium Graveolens Flower Oil**, Boswellia Carterii (Olibanum) Oil***, Limonene, Linalool, Citronellol, Geraniol, Ganoderma Lucidum (Reishi Mushroom) Extract, Fuscoporia Obliqua Sclerotium Extract, Cordyceps Sinensis (Mushroom) Extract, Ergothioneine, Camelina Sativa Seed Oil, Lactobacillus Ferment, Hippophae Rhamnoides Extract*, Zingiber Officinale (Ginger) Root Extract*, Curcuma Longa (Turmeric) Root Extract*, Ocimum Sanctum (Holy Basil) Leaf Extract, Helianthus Annuus (Sunflower) Seed Oil*, Silybum Marianum Fruit Extract, Saccharomyces Lysate Extract, Centella Asiatica (Hydrocotyl) Extract, Hypnea Musciformis (Algae) Extract, Caffeine, Sucrose*, Salvia Sclarea (Clary) Extract, Saccharomyces Ferment Filtrate, Peg-40 Hydrogenated Castor Oil, Gellidiella Acerosa Extract, Trideceth-9, Glycerin, Glycereth-26, Polysorbate 20, Sodium Hyaluronate, Tocopheryl Acetate, Maltodextrin, Pentylene Glycol, Sodium Hydroxide, Citric Acid, Potassium Sorbate, Phenoxyethanol *Organic Sunflower Oil, Organic Sea Buckthorn Extract, Organic Ginger Extract, Organic Turmeric Extract, Organic Sucrose (Brown Sugar)**Organic Essential Oils: Organic Orange Oil, Organic Mandarin Oil, Organic Patchouli Oil, Organic Geranium Oil, Organic Lavender Oil ***Essential Oil. Esta loção tem ingredientes especiais, além de Ganoderma lucidum pode resistir à inflamação, adequado para todos os tipos de pele, especialmente comprado para o problema causado pela mudança da estação atual, grande amor vale a pena recomendar!